In 1886 the London and South Western Railway built a new direct line from Brockenhurst to Bournemouth. Of the four stations built along the line, one was just north of the village of Milton. The train station and the adjacent railway cottages were the very first buildings in the town of New Milton. At about this time a man called Hugh Wyeth, a brewer from Winchester, saw an opportunity to invest in the area. 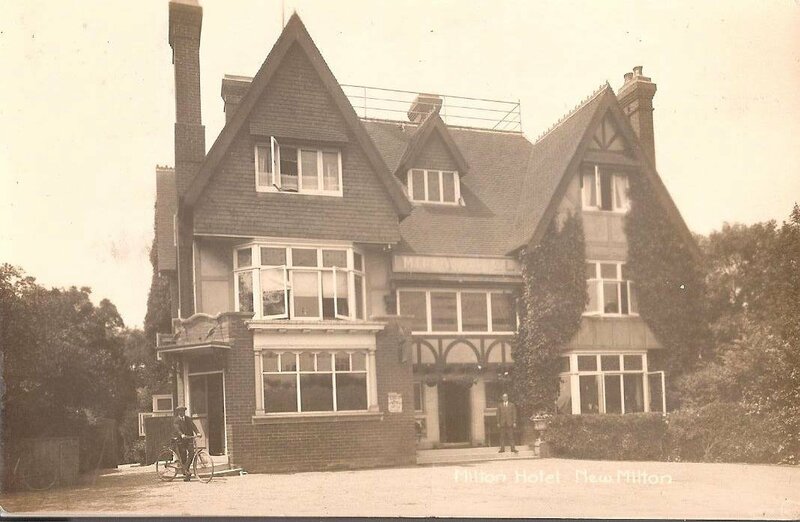 He built a hotel next to the railway station, and called it the ‘Milton Hotel’. 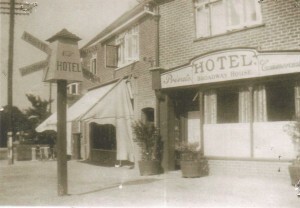 In addition there were two shops built opposite the hotel on the north side of the railway line. 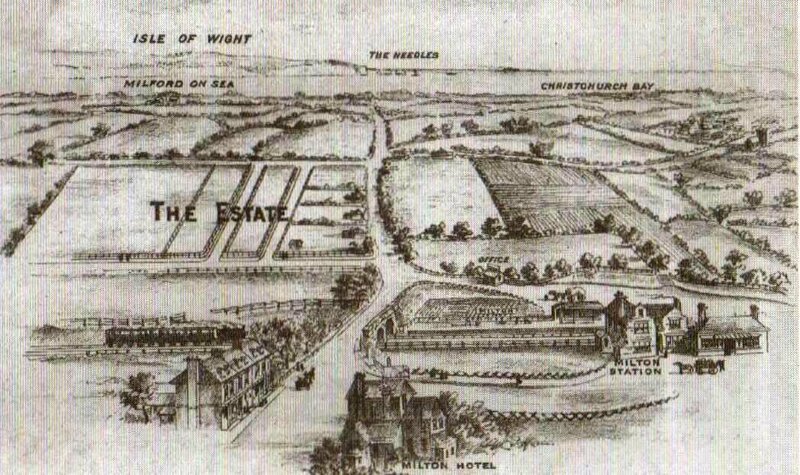 By about 1894 the area around New Milton would have looked similar to this image taken from a sale catalogue of land in the area. The two shops built opposite the Milton hotel were used as a post office and a motor garage. 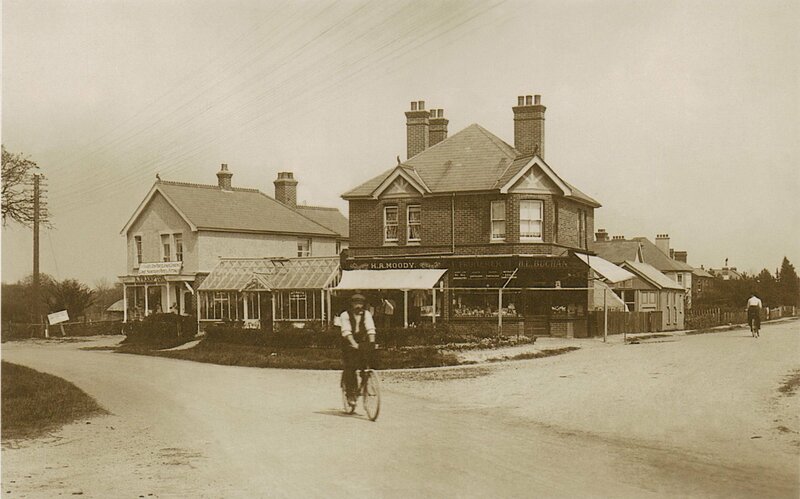 The post office was run by a Mrs Emma Newhook, who in 1895 named it the ‘New Milton Sub Post Office’. 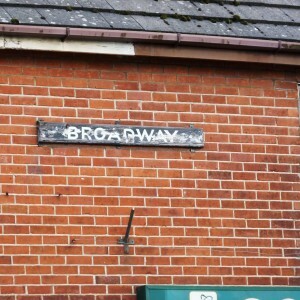 In 1896 the parish council agreed to this name. On 1st of May 1897 the LSWR used the name for the railway station. That is how our town became known as New Milton. In about 1898 the post office moved to the corner of Station Road and Whitefield road and the garage took over both shops. 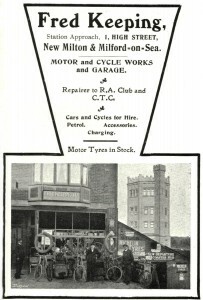 The building is still used for the same purpose today as it is the site of Williams Bridge Garage. 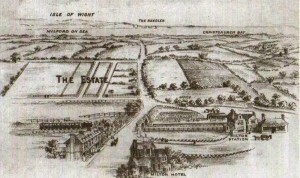 Hugh Wyeth further invested in the area by building a hall and a shop opposite the southern entrance to the railway station. The shop was run by the grocery company Misselbrook and Weston. 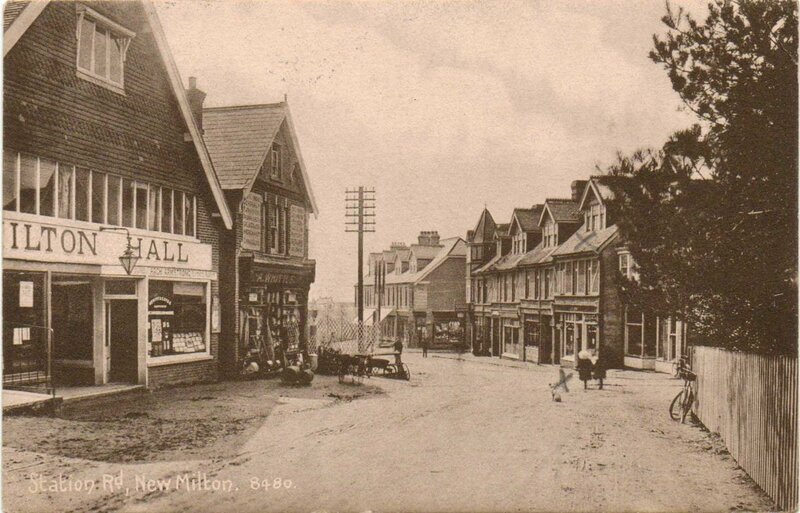 The Milton Hall was used for a number of purposes, such as a dance hall, auctioneers premises, an estate agents and a bank. Many readers will remember its use as ‘Porter and Clarkes’ gardening centre. It has recently been used as a bed and carpet retailers and is about to re-open in a new guise. Further shops were built north of the railway bridge. 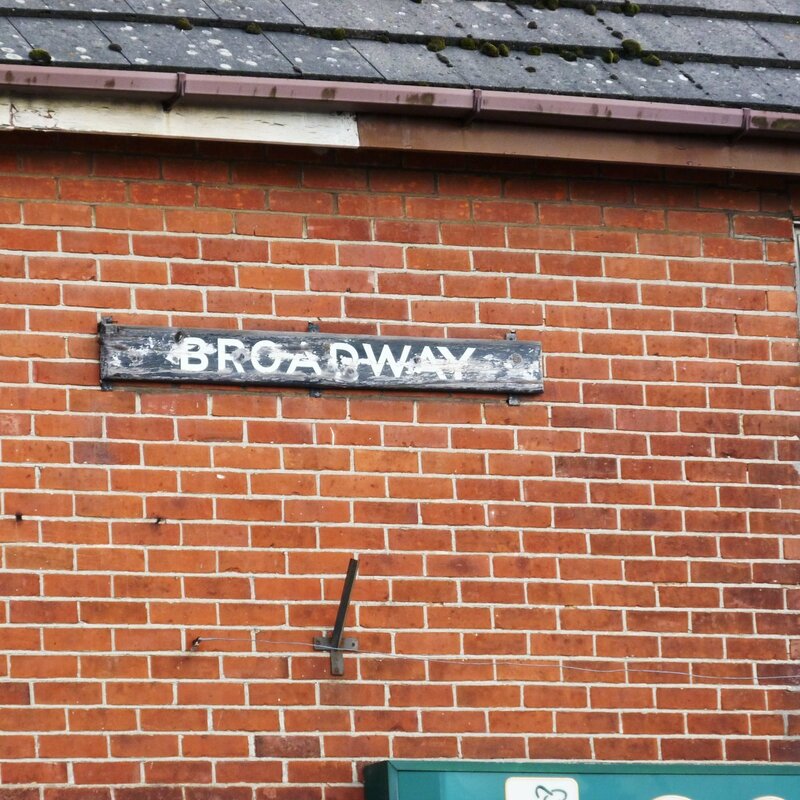 These became known as ‘The Broadway’ and the sign bearing this name is still visible above the shop fronts today. These shops have had a number of uses over the years. 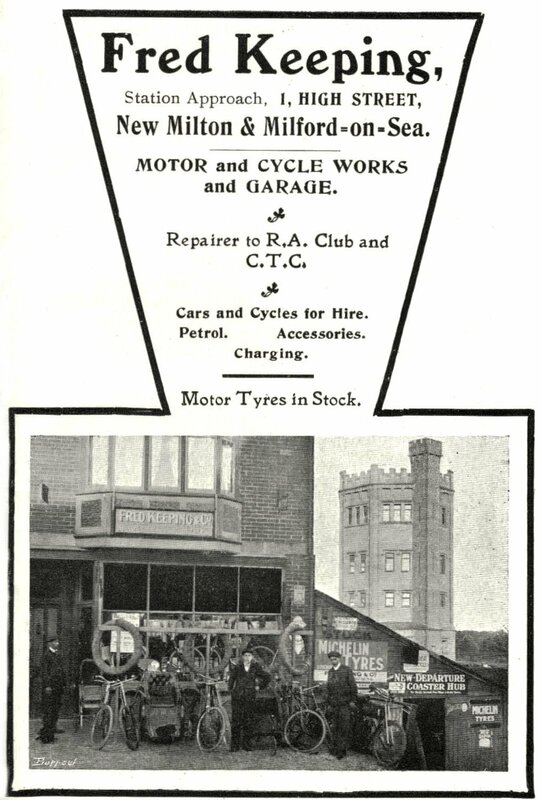 Along with Williams Bridge Garage other long term residents have been H. Drew builders, and Dorothy Cafe. 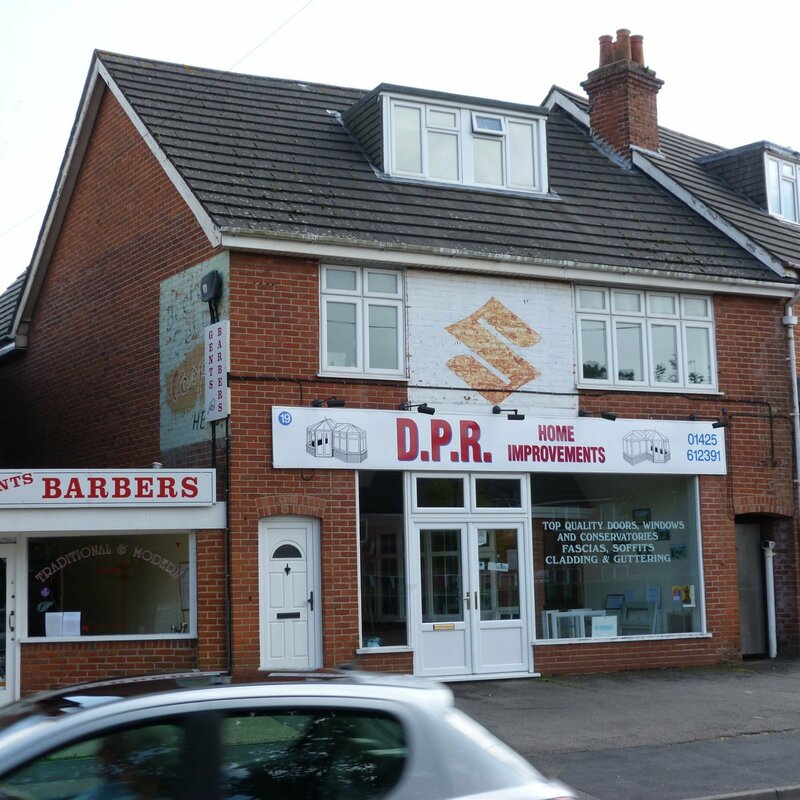 The shop that is now DPR Windows was for many years M. W. Cook a motorcycle shop. 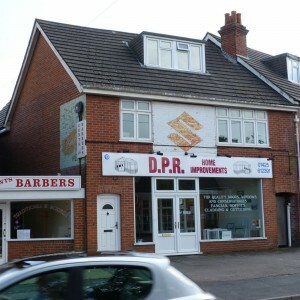 If you look above the DPR shop front you can see a painted sign for Suzuki motorcycles and on the side of the building an advert for Vespa scooters. The shop next door, currently the Co-Op Funeral Directors, has had many lives. In the 1930s it was a shoe shop. It has also been used as a hotel then a tobacconist called ‘The smokers shop’ run by a Mr and Mrs Pye. The brick archway to the left of the hotel in this photo is one on the right hand side of the DPR image. 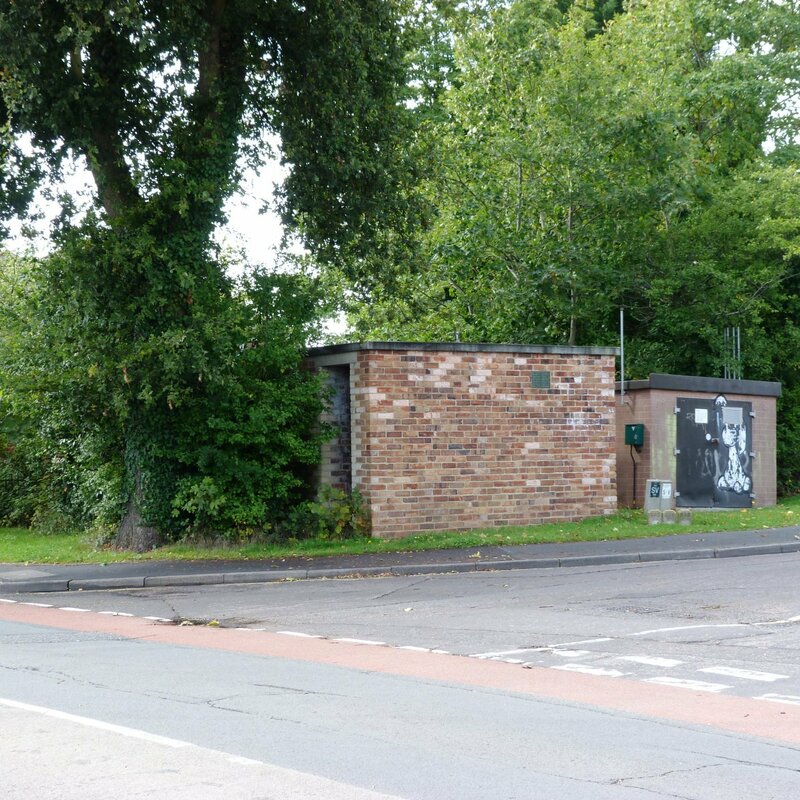 Another building north of the railway bridge and literally hidden away is that of the old World War Two air raid shelter constructed in about 1940. It is on the corner of the Broadway and Avenue Road. Today it is hidden away in bushes and undergrowth. It is used as an electricity substation for the area. 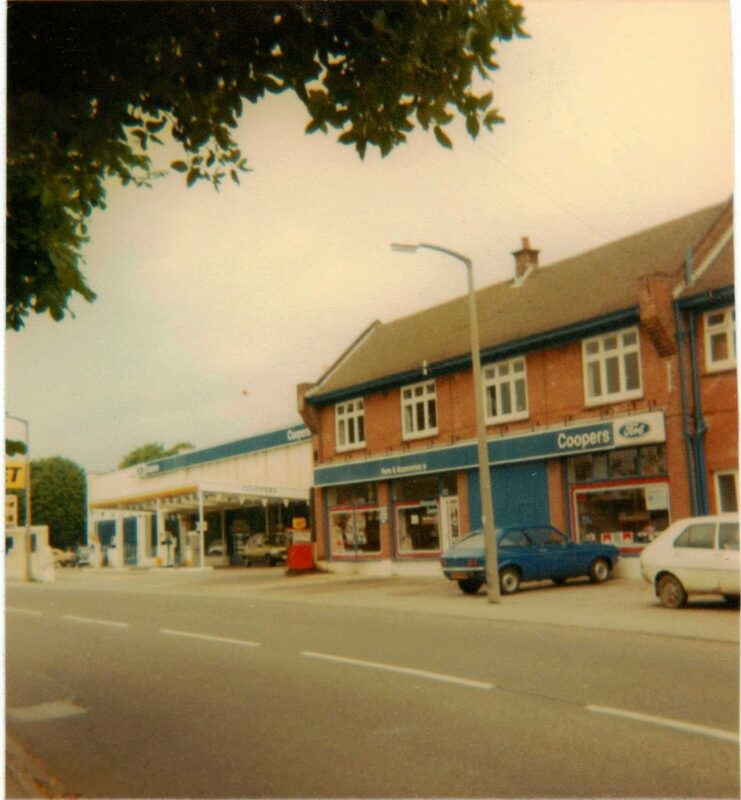 Going further north to the junction of Manor Road the shop on the corner, now a bed shop was used as a greengrocers as seen here in this image. It also saw service for many years a furniture shop. Next door was a hardware shop and glaziers run by a Mr Frampton. Further down the road in the direction of the pond, was a garage which started out as the Milton Garage run by a Mr Fagen. In the 1930s it was taken over by George Cooper. 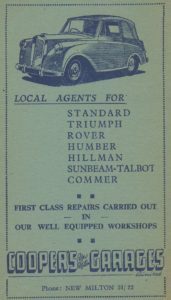 Coopers Garage continued trading under the direction of Georges son Peter until the business folded in the early 1980s. The site was sold and the current residential properties were built. 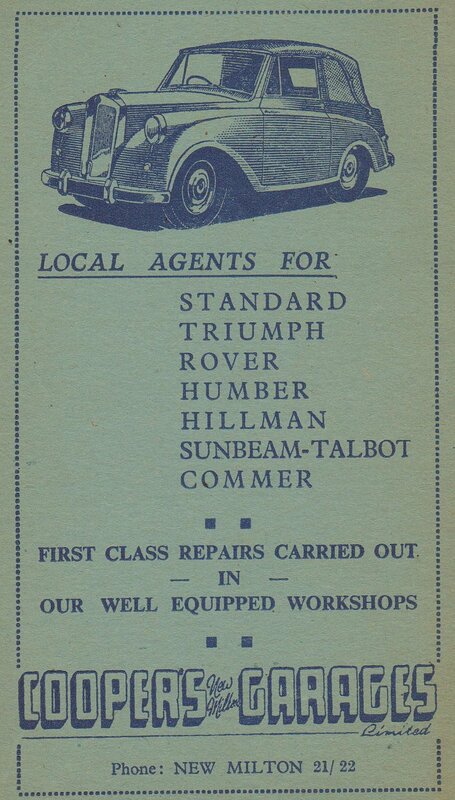 Coopers garage, in its heyday was the regional distributer for Ford motor cars. Peter Cooper entered many motor rallies and later went on to become chairman of the BARC which ran the British Grand Prix. Opposite Coopers Garage is Fernhill Manor, one of the oldest buildings in our town. Fernhill is mentioned in the Domesday book. At one stage it was home to Thomas Whyte, who served 3 kings and Queen Anne as commander of the Royal Bodyguard. He died in 1720 and his bust can be seen in St Mary Magdalene Church. The building is reputed to have a 17th century exterior but some parts of the interior are believed to be 16th century. In 1919 it became Fernhill Manors girls school eventually merging in 1995 with Edinburgh House school to form Ballard College. The top end of town is very much a part of the early history of New Milton and in the case of Fernhill the locality. Who knows what it will look like in another hundred years?